Jointly initiated by renowned economists, entrepreneurs and prominent citizens in China, National Economics Foundation (NEF) is aimed to impel theoretical innovation and economics science to prosper. The foundation, an international academic platform for the theoretical economics researchers of Chinese origin, will present the China Economics Prize, outstanding Doctoral Paper on China’s Economics Research, series of activities including Great Minds China Forum and encourage dedicated researches. We will award those innovative Chinese economics researchers, carry forward the academic thoughts of economics researchers of Chinese origin and encourage Chinese economists to make contribution to the world’s economics science. China Economics Prize is the award founded and led by the National Economics Foundation. The purpose is to advance theoretical innovation, boost economic science and contribute to economics thoughts by virtue of awarding those innovative Chinese scholars who are great contributors to the economics theories.We will endorse one award each year in the amount of 2000,000RMB, and gdden medal. The nomination committee is composed of the academic advisors of NEF, members of NEF Academic Committee, top international economics journals chief editors, top China economics journals chief editors and distinguished Economics Professors from abroad. Outstanding Doctoral Thesis on China’s Economics Research is the award founded and led by the National Economics Foundation. The purpose is to promote exploring spirits in academic economics education, and to encourage economic science theoretical innovation. The award amount for each paper is 100,000RMB, and silver medal. We will select 10 papers each year in the amount of 1000,000RMB. The nominators are composed of directors from mainland schools of economics & research institutions, and directors from schools of economics & research institutions in Hong Kong, Macao and Taiwan. Contemporary economics is characterized by different schools of economic thoughts and diversified economic argumentation on how economics works. The study of each school’s theoretical view, analytical approach and policy proposition contributes to the development of economic science in China. 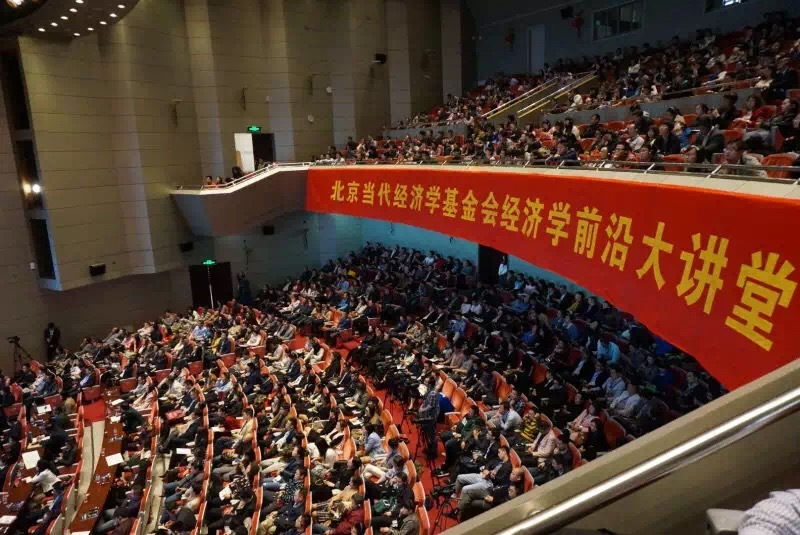 National Economics Foundation will invite Nobel laureates and the world-renowned economists to deliver speeches from varied perspectives on economics theoretical innovation and application in “Economics Frontier Lectures” which will be held at different universities in China. The “Economics Frontier Lectures” will be opened to both university students and the public. It will be an economics journey, allowing listeners from varied academic backgrounds to learn interdisciplinary information, so that they can grasp the frontier knowledge of economic science and perceive the pulse of economic pace. The rising of big powers is always accompanied by the blossoming economics thoughts. Chinese nation cannot be fully rejuvenated without the advancement of economics thoughts. The prophecy, that the 21st century is the Chinese Century, will not come true unless we overthrow the stereotype that we put more emphasis on empirical study and counter-measure research rather than the innovation of the basic theories. We must regain China’s leading center of world’s civilization and economics thoughts. By establishing an international academic platform for the theoretical economics researchers of Chinese origin, the National Economics Foundation initiates Great Minds China Forum which will be held once a year. The forum creates a think-tank for the eminent academics to exchange ideas and thoughts that center around the topic of “the innovation of economic science”. National Economics Foundation, jointly with relevant universities, establish es a research base to study economic thoughts of Chinese origin. The base is committed to propagate innovation of economic thoughts among ethnic Chinese worldwide and to summarize their academic thread. Besides, we will publish Contemporary Ethnic Chinese Economic Thoughts and provide strong support to the approval of China Economics Prize. The NEF initiated a public welfare program “World-renowned Economists Interview” to support the selection of China Economics Award and prepare for Great Minds China Forum, on the basis of “encouraging theoretical innovation and promoting economic science”, so as to provide an opportunity for scholars to learn about the economics research frontier and foreign scholars’ theoretical innovation ways. So far, interviews have been conducted with dozens of domestic and overseas distinguished economists and chief editors of world’s leading economic journals such as Lin Yifu, Bai Chongen, Xu Chenggang, Fan Gang, Hong Yongmiao, Huang Youguang, Li Bozhong, Luo Weidong, Ma Debin,Shi Zhengfu,Wei Sen, Xu Xiaonian, Zhang Shuguang, Zhou Lin,Yuk-fai Fong,Jack A. Goldstone,James Morris ,Stiglitz ,Hans Michael Trautweinand Pol Antràs.